Welcome to Black Friday - retailers' favorite time of year. With the U.S. economy strong, forecasts are signaling massive sales over the five-day period. Brian Cornell, chief executive officer of Target Corp., has said that the industry is enjoying possibly the strongest environment he's seen in his 37-year career. This hasn't stopped concerned investors from asking: Is this as good as it gets? With sales growth starting to slow, shares of some big-box retailers like Walmart Inc. have been under pressure as Wall Street sees tougher days ahead. So good or bad, Black Friday could be an early indication of what awaits the industry in the coming months. As of 5 p.m. on Thanksgiving day, Adobe Analytics said it had seen about $1.75 billion of online spending. That's an increase of almost 29 percent from a year ago. Adobe, which will provide updated results throughout the weekend here, is measuring transactions from 80 of the top 100 U.S. online retailers. It is forecasting Thanksgiving online sales will reach a record $3.7 billion. An estimated 164 million people plan to join the shopping frenzy that stretches from Thanksgiving Day through Cyber Monday. That's about the same as last year, according to the National Retail Federation. Friday will be the most popular day, with 71 percent of respondents in its survey opening their wallets then. Black Friday alone will produce $24 billion in sales, excluding automobiles, gasoline and restaurants, research firm Customer Growth Partners estimated. That total will climb to about $60 billion through Sunday. While Black Friday is often the biggest single shopping day of the year, the firm expects it will be topped this year on Dec. 22, the Saturday before Christmas, with projected sales of $26 billion. Retailers are ready for the onslaught, bringing in a ton of inventory. Ports on the West Coast have been reporting record shipments in the walk-up to the season. Some of the surge is likely because of companies importing goods from China ahead of a big increase in tariffs on Jan. 1, according to the Port of Oakland. Customer Growth Partners expects total holiday retail sales to climb 5.1 percent from last year. Deloitte predicts the final two months will result in as much as 5.6 percent growth, while the NRF sees it rising as much as 4.8 percent, excluding automobiles, gasoline and restaurants. Households plan to spend an average of $1,536, according to an October report from Deloitte. That's 25 percent more than respondents in last year's survey said. Growing confidence in the U.S. economy and an improvement in household financial security are behind the increase, Deloitte said. About 40 percent will be spent on experiences, like entertaining at home. Gifts and gift cards account for about 34 percent. Nordstrom Inc., Walmart and Target saw big gains in online sales the week before Thanksgiving, according to a report from Edison Trends, an e-commerce research company. Nordstrom's web revenue almost doubled over the period — Nov. 15 to Nov. 21 — from a year earlier, while Walmart's increased 67 percent. Target Corp., Macy's Inc., Amazon.com Inc. and Best Buy Inc. also saw sales rise, according to Edison. E-commerce is now a key part of the equation. 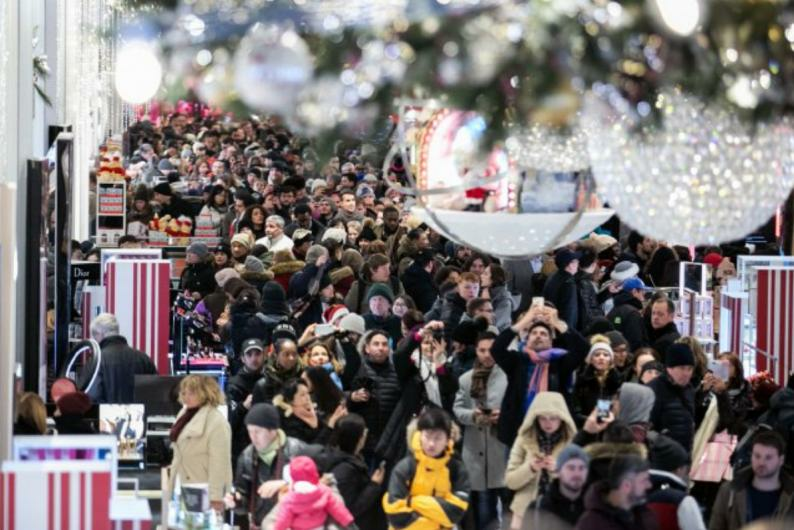 A Deloitte survey released this week shows 91 percent of holiday shoppers plan to head online during the long weekend, whereas 89 percent said they'd battle the crowds in stores. Retail chains have invested heavily in their mobile and web channels and delivery service. This is expensive, however, and eroding margins has sparked questions about how companies will deal with the expense if the good times come to an end. In the first 20 days of November, shoppers spent $31.9 billion online, a jump of almost 17 percent from a year earlier, according to Adobe Analytics. That included Monday — the first "$2 billion day" of the season, Adobe said. EMarketer Inc. sees web sales for the holiday season rising almost 17 percent to $123.7 billion. Consumers are becoming more comfortable shopping with their phones, and major retailers are taking advantage of that by investing in mobile apps, according to Lexi Sydow, a senior analyst for mobile insights provider App Annie. Time spent in mobile shopping apps — a proxy for shopping volume — is expected to jump 25 percent over the next two weeks from a year earlier, according to the researcher.